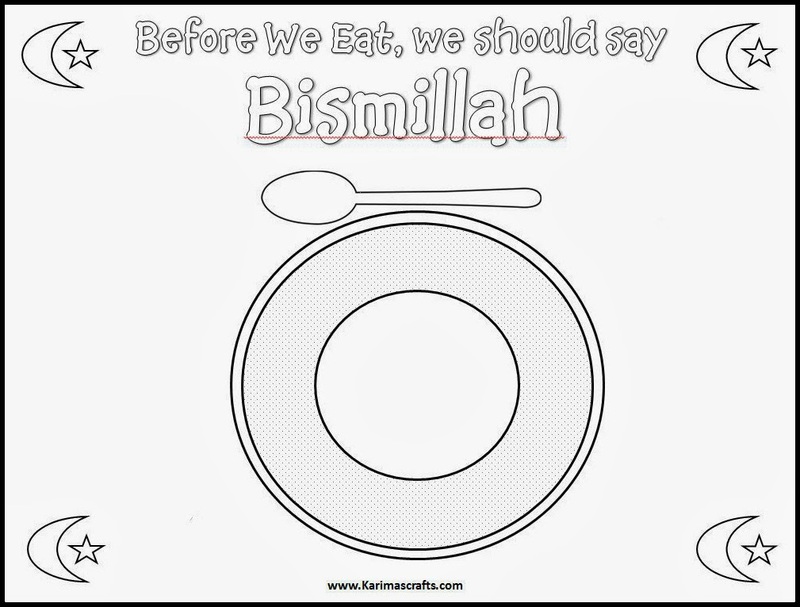 What a great way for children to remember to say Bismillah before they eat - to see it on their own placemat! 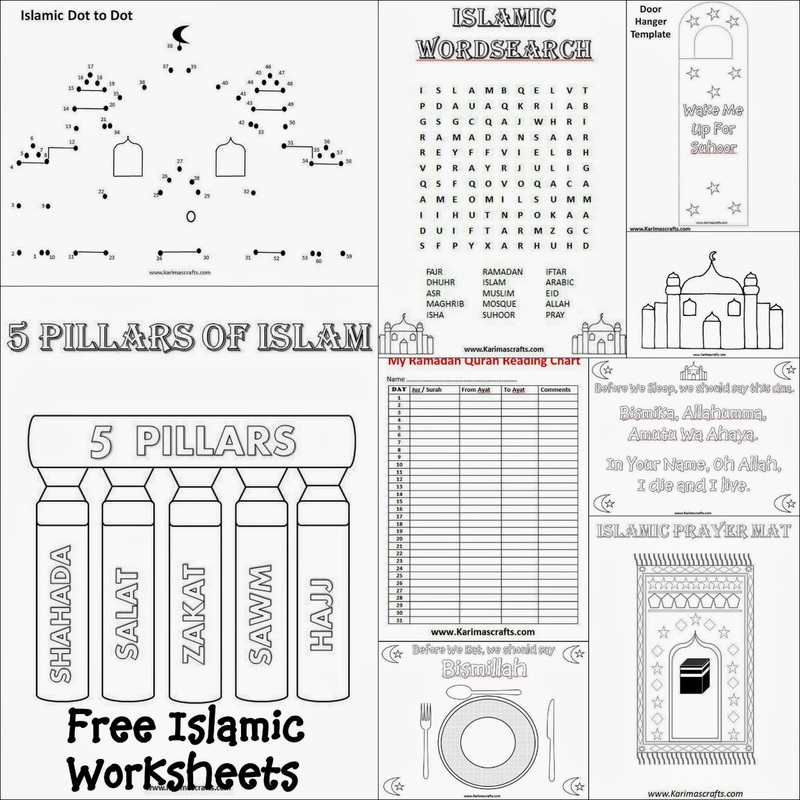 I have designed a few Islamic Worksheets which will be great for Children to do during the month of Ramadan. I am new to this type of designing and making PDF's free for you to download so there are only a few of my own designs at the moment, however I have also given some links to some other really great worksheets from some other websites that I would highly recommend. You will find these other great links at the bottom of my post. The Placemat worksheet would ideally be laminated once coloured in to make best use of it. You could also make up your own design on A4 Paper/Card and laminate it and make special use of it during Ramadan and maybe afterwards too! My children love making laminated placemats or Door Signs! I have now added another placemat (19 Feb 2014) this time I changed the design to just have a spoon. The link will be at the bottom with the other download links. Here are two photos including one of my daughter enjoying colouring in Easel and Ink's worksheets. 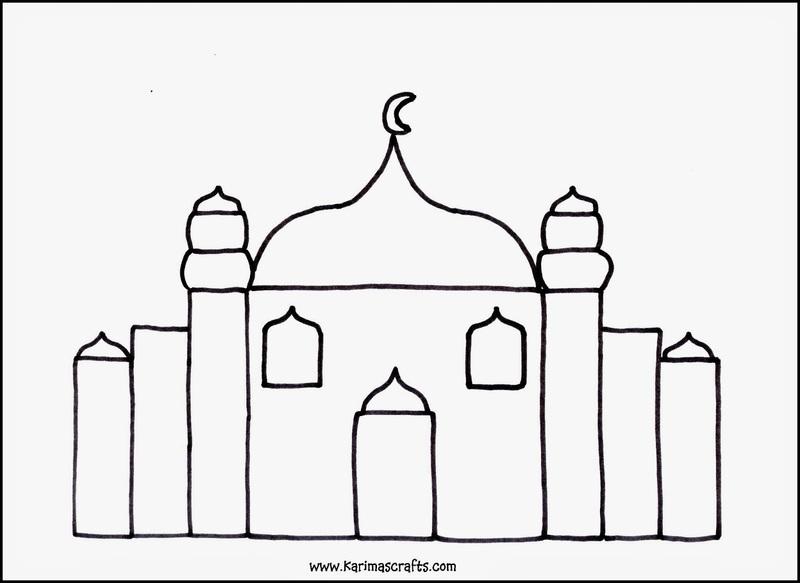 Don't Forget that if you have made any of the Ramadan Crafts that I have blogged about, then please send in a photograph and I will publish this on my blog and my Facebook Page! You can send this via email karimascrafts@gmail.com or post on my Facebook Page Karimas-Crafts directly. Grea job - will definitely be sharing this post on www.facebook.com/ConsciousParentingApproach - Jazak Allahu Khair! These are awesome Karima!! !MashaAllah, may Allah reward you. Ramadan Mubarak! I have been following your posts ever since I found you last month through pinterest. I have tried some of your projects and my kids have loved all of them. Alhamdulillah. Your ramadhan craft made this ramadhan with my kids the best. N this placement just blew me off :) can't wait to do it with them. Yup I have taken pictures which il share with you once I become free in sha Allah after ramadhan. May Allah swt bless you and your loved ones for all the pains you take to share your work. For you n your family Jazakumullahu khairan. Mashallah this is a great resource. Looking forward to using with my little one. Have just shared on Twitter. May Allah reward you. Yes! Finally something about ramadan krasniqi. Mashallah .... so creative ideas to implement Islam in our daily life .... jazak allah khair for sharing ... barak allahu laka! Really good for my Ramadan activities week at my school...Alhamdulillah found this useful web..
Assalaamu alaikum Sis! Thanks for sharing! I see you listed my old blog MuslimMamaof4. 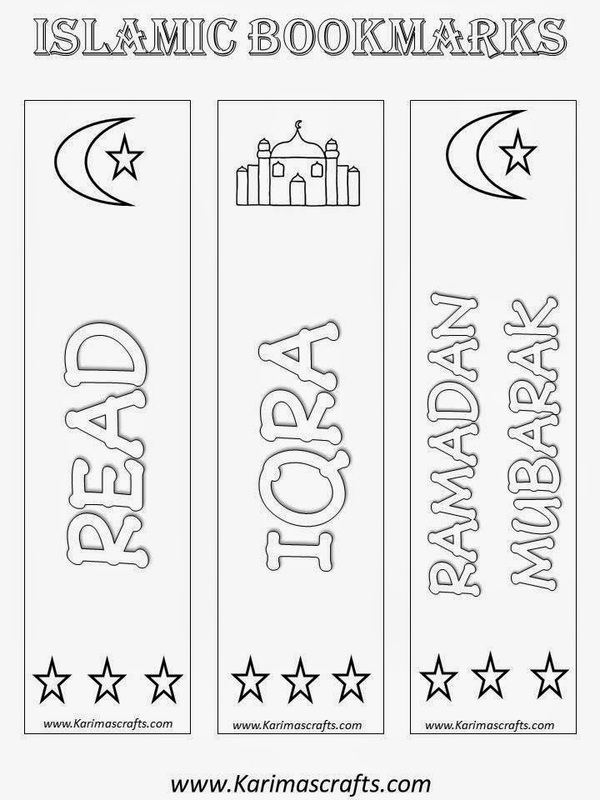 You can now find some of my printables at http://ourprecioussprouts.blogspot.com/search/label/Ramadaan. JazakiAllahu khairan!! Very Entertaining and Helpful for Children. I am so glad I came across this page!! I just opened an Islamic Educare in South Africa and will be using so many ideas for my kiddies. InshaAllah will share on your facebook page!